California Western School of Law, San Diego, California, 2016, J.D. West Virginia University, Morgantown, West Virginia, 2011. Queens University of Charlotte, Charlotte, North Carolina, 2007, B.A. 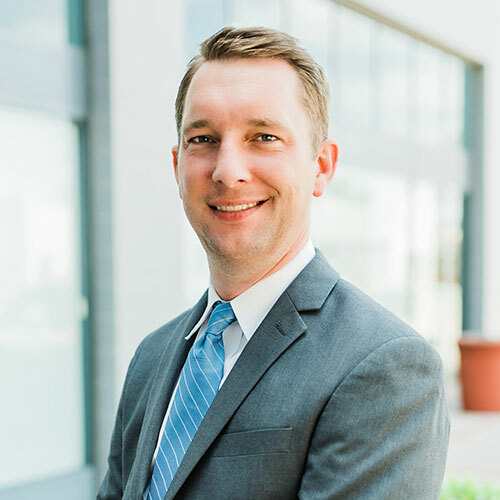 Drew Hendricks’ unique background and strong interpersonal skills have proven to be a valuable asset when advocating for his clients. Drew received his Bachelor of Arts from Queens University of Charlotte, where he majored in Psychology and served as captain of the university tennis team. After college, he attended graduate school at West Virginia University, where he earned master’s degrees in social work and public administration, and participated in many community outreach projects. He also demonstrated exceptional work ethic by completing two master’s programs while simultaneously working as a tennis coach to help pay for his education. He later received his Juris Doctor degree from California Western School of Law, where he was a Dean’s List student and member of the Pro Bono Honors Society. Prior to attending law school, Drew was a Licensed Graduate of Social Work and held a variety of positions in both the non-profit and public sector; including the WV Legislature and WV State Treasurer’s Office. However, it was his experience working for a non-profit, North Central Community Action Association (NCWVCAA), that sparked his passion for family law. At NCWVCAA, he assisted low-income families and individuals to gain access to supportive services, such as transitional housing, settlement houses, women’s shelters, affordable childcare, etc. Through this experience, he learned first-hand how access to legal knowledge can have a tremendous effect on people’s lives. During law school, Drew interned at the Family Law Facilitator’s Office in San Diego, where he assisted unrepresented parties with a number of family law issues, such as divorce, child custody, child and spousal support, domestic violence restraining orders, and marital settlement agreements. Drew also gained valuable litigation experience through California Western’s Pro-Bono Traffic Court Clinic, where he successfully represented motorists by litigating their traffic infractions before the San Diego Superior Court. Drew began working for Wilkinson & Finkbeiner as a certified law student through California Western’s clinical internship program and was subsequently hired as an associate attorney. Since that time, Drew has continued to enjoy his reputation of taking a very hands-on approach to working with his clients. His prior experiences as a social worker, public servant and collegiate athlete have helped Drew to become a dedicated attorney with a strong passion for serving his client’s needs.